Just east of Missoula, with a rich history in logging, Bonner is quickly becoming a gateway to outdoor recreation in the Blackfoot, Seeley and Swan valleys. 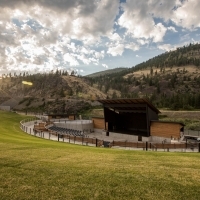 Lately, Bonner's main attraction is the new KettleHouse Amphitheater, a unique outdoor music venue serving up national music acts and award-winning beer on the banks of the Blackfoot River. As you're traveling along the Blackfoot River on Highway 200 just east of Bonner, keep your eyes open for bighorn sheep that make their home in the area.